Background: Oil pulling therapy has been used extensively as a traditional Indian folk remedy for many years for strengthening teeth, gums, and jaws and to prevent decay, oral malodor, bleeding gums and dryness of throat, and cracked lips. Aims: The aims of this study were to evaluate the effect of oil pulling with sesame oil on halitosis and the microorganisms that could be responsible for it and to compare its efficacy with chlorhexidine mouthwash. Materials and Methods: Group I (oil pulling) and group II (chlorhexidine) included 10 adolescents each. The following parameters were assessed: marginal gingival index, plaque index, organoleptic breath assessment (ORG 1), self-assessment of breath (ORG 2), and BANA test from tongue coating samples on days 0 and 14 of the experimental period. Results : The comparisons of the pre and post therapy values of plaque and modified gingival index score showed a statistically significant difference (P = 0.005 and 0.007, respectively) in group I and II. There was a definite reduction in the ORG 1, ORG 2, scores and BANA test score in both groups I and II. Conclusions: Oil pulling therapy has been equally effective like chlorhexidine on halitosis and organisms, associated with halitosis. For oil pulling therapy, a tablespoon (teaspoon for young children above 5 years of age) of sesame oil is taken in the mouth, sipped, sucked, and pulled between the teeth for 10 to 15 min. The viscous oil turns thin and milky white. The oil should not be swallowed as it contains bacteria and toxins. Oil pulling therapy should be followed by tooth brushing and is preferably done on empty stomach in the morning. There is no scientific proof to accept oil pulling therapy as a treatment adjunct to cure halitosis. Online searches in pubmed and other databases show only testimonies and literature on personal experiences. Pilot studies conducted by Asokan et al have shown that the oil pulling therapy with sesame oil has been equally effective in reduction of S. mutans count, plaque index, and modified gingival index scores as compared to chlorhexidine mouthwash. , So, this study was planned with the following aims and objectives. To evaluate the effect of oil pulling with sesame oil on halitosis and microorganisms which could be causing it in adolescents. To compare the efficacy of oil pulling and use of chlorhexidine mouthwash on halitosis. The following parameters were assessed: MGI, PI, organoleptic breath assessment (ORG1) by a blinded and calibrated examiner (examiner A), Self-assessment of breath (ORG2) by participant themselves, BANA test from tongue coating samples (Examiner B) on days 0 and 14 of the experimental period. The study group was subjected to oil pulling with sesame oil (Idhayam Oil, VVV Sons India) for 10 to 15 min every day in the morning before brushing. The control group was given 0.2% chlorhexidine mouthwash (Hexidine, ICPA Health Products Ltd, India) for 1 min every day in the morning for 14 days. The participants of both the groups were allowed to brush their teeth once daily as per their daily home oral hygiene schedule. 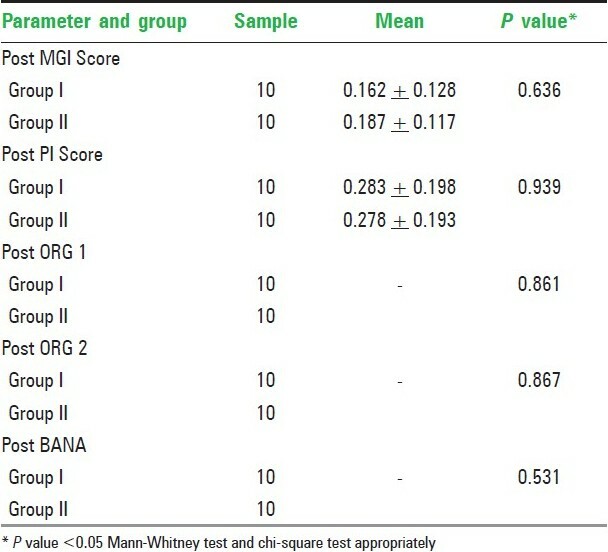 The pre and post values of the PI, GI, ORG1, ORG2, and BANA test within the same group were compared using Wilcoxon signed ranks test and chi-square test appropriately. The comparison of the pre values and the post values between the two groups was done using Mann-Whitney test and chi-square test appropriately. In the present study, P<0.05 was considered as the level of significance. The statistical analysis was done using the software SPSS version 15 (SPSS Inc., Chicago). The examiners who assessed the index scores, collected the tongue coating samples, and interpreted the results, the organoleptic rating judge, and the statistician were blinded about the division of groups. 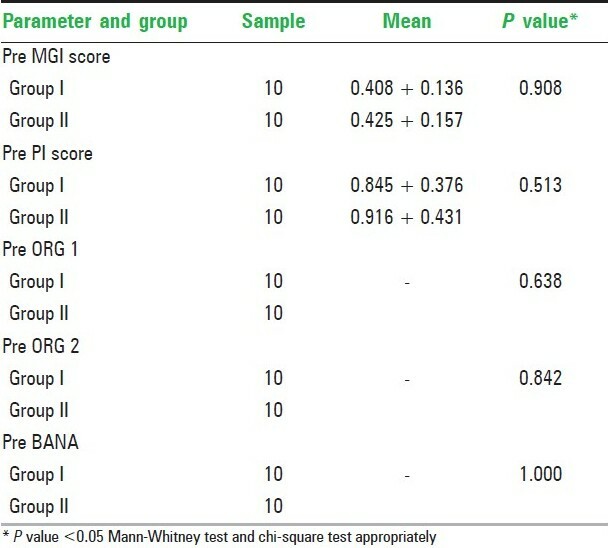 [Table 1] shows the comparison of the baseline (pre) values of the MGI scores, PI scores, ORG 1, ORG 2, and BANA between groups I and II. There was no statistically significant difference in any of the scores indicating that the baseline values of both the groups were almost the same. The comparison of the post therapy values of the all the 5 parameters between the two groups showed no significant difference [Table 2]. The comparisons of the pre and post therapy values of plaque index score and modified gingival index score showed statistically significant difference (P = 0.005 and 0.007, respectively) in groups I and II, as shown in [Table 3] and [Table 4]. There was a definite reduction in the ORG 1, ORG 2 scores, and BANA test score in both group I and II. But only the self-assessment breath score (ORG 2) showed statistically significant reduction in group I.
Halitosis mainly originates from volatile sulfide compounds (VSCs), especially hydrogen sulfide, methylmercaptan, and dimethyl sulfide as first discovered by Tonzetich. Diamines, indole, skatole, butyric of propionic acid in the mouth air can also cause the offensive odor. Most of the malodor-causing compounds result from proteolytic degradation of peptides present in saliva, shed epithelium, food debris, and plaque by oral microorganisms. Gram-negative, anaerobic bacteria possess such proteolytic activity. Bacteria associated with gingivitis and periodontitis are almost all gram negative and are known to produce VSCs. Self-examination, organoleptic rating, sulfide monitor, gas chromatography electronic nose, diamond probes, dark field microscopy, and saliva incubation tests are some of the methods of identifying malodor. Sulfide monitor (Halimeter) or gas chromatograph (Oral Chroma) is very expensive; inexpensive Tanita Breath Alert Monitors are not very reliable and so in this study the "gold standard" organoleptic assessment was done. Self-examination was included as a part of the study to actively involve the participants and also to get a subjective feel response from them at the end of the study. The dorsal tongue mucosa shows a very irregular topography and the innumerable depressions are ideal niches for bacterial adhesion and growth, sheltered from cleaning actions. , The accumulation of food remnants intermingled with exfoliated cells and bacteria causes a coating on the tongue dorsum. Samples from tongue dorsum, a source of oral malodor ,, were collected and placed on BANA test strip in this study. Chlorhexidine is considered the most effective antiplaque and antigingivitis agent. ,, Chlorhexidine rinsing provides a significant reduction in VSC levels and ORG scores because of its strong antibacterial effects and superior substantivity in the oral cavity. ,,, Rosenberg et al showed that a 0.2% chlorhexidine regimen reduced the VSC values by 43% and ORG scores by more than 50%. De Boever and Loesche  reported that a 1-week rinsing with 0.12% chlorhexidine, in combination with tooth and tongue brushing, significantly reduced VSC levels, mouth odor, and tongue odor by 73%, 69%, and 78%, respectively. Morning halitosis was reduced up to 90%. Hence, the gold standard mouthwash was used as the positive control in the clinical trial. In this study, oil pulling therapy has been equally effective like chlorhexidine against halitosis and organisms which are associated with halitosis. Sesame oil has the following advantages over chlorhexidine: no staining, no lingering after taste, and no allergy. Sesame oil is five to six times cost-effective than chlorhexidine and is readily available in the household. There are no disadvantages for oil pulling therapy except for the extended duration of the procedure compared with chlorhexidine. Although oil pulling therapy cannot be used as a treatment adjunct as of now, it promises to be a better preventive home therapy in developing countries like India. Extensive studies with larger samples, varying time periods, and longtime follow-up should be carried out to establish the efficacy of oil pulling therapy in prevention of halitosis. The exact mechanism of action of oil pulling therapy is still not clear and we are currently carrying out research in this area. More studies with sesame oil can open new doors in the field of research in oral health care. We would like to thank Mr. V.R. Muthu B.Com (Hons), Idhayam Group, Virudhunagar for his financial support and encouragement. Thanks to Dr. S. Swathi BDS and Dr. G. Vaishnavi BDS for helping us in carrying out the study. We extend our regards to our statistician Dr. S. Porchelvan M.Sc, M.B.A, PhD and all the participants of this study. 1. Quirynem M, van Steenberghe D. Oral malodor. In clinical periodontology. In: Newman, Takei, Klokkevold, Caranza, editors. 10 th ed. Philadelphia: Saunders -An imprint of Elsevier: 2006. p. 330-42. 2. Persson S, Claesson R, Carlsson J. The capacity of subgingival microbiotas to produce volatile sulfide compounds in human serum. Oral Microbiol Immunol 1989;4:169-72. 3. Persson S, Edlund MB, Claesson R, Carlsson J. The formation of hydrogen sulfide and methyl mercaptan by oral bacteria. Oral Microbiol Immunol 1990;5:195-201. 4. Yaegaki K, Sanada K. Biochemical and clinical factors influencing oral malodor in periodontal patients. J Periodontal 1992;63:783-9. 5. Yaegaki K, Sanada K. Volatile sulfide compounds in mouth air from clinically healthy subjects and patients with periodontal disease. J Periodont Res 1992;27:233-8. 6. Delanghe G, Ghyselen J, van Steenberghe D, Feenstra L. Multidisciplinary breath-odour clinic. Lancet 1997;350:187. 7. van Steenberghe D. Breath malodor. Curr Opin Periodontol 1997;4:137-43. 8. Available from: http://www.maharishi-european-sidhaland.org.uk. [accessed on 2006 Jan 23]. 9. Available from: http://www.oilpulling.com [accessed on 2005 Dec 25]. 10. Available from: http://www.indiaids.org/alt_ther/ayurveda.asp#a4.com [accessed on 2007 Jan 2]. 11. Available from: http://www.ayurvediccure/mouthcare.htm [accessed on 2007 Jan 2]. 12. Available from: http://en.wikipedia.org/wiki/Oil_pulling.com [accessed on 2007 Oct 2]. 13. Asokan S. Oil pulling therapy. Indian J Dent Res 2008;19:169. 14. Available from: http://www.healthstores/sesameoil.com [accessed on 2006 Jun 13]. 15. Asokan S, Rathan J, Muthu MS, Rathna Prabhu V, Emmadi P, Raghuraman R, et al. Effect of oil pulling on Streptococcus mutans count in plaque and saliva using Dentocult SM strip mutans test: A randomized controlled triple blind study. J Indian Soc Pedo Prev Dent 2008;28:12-7. 16. Asokan S, Emmadi P, Raghuraman R, Chamundeeswari V. Effect of oil pulling on plaque induced gingivitis: A randomized controlled triple blind study. Indian J Dent Res 2009;20:47-51. 17. Peruzzo DC, Salvador SL, Sallum AW, da Rocha Nogueira-Filho G. Flavoring agents present in a dentifrice can modify volatile sulfur compounds (VSCs) formation in morning bad breath. Braz Oral Res 2008;22:252-7. 18. Rosenberg M, McCulloh CA. Measurement of oral malodor: Current methods and future prospects. J Periodontol 1992;63:776-82. 19. Tonzetich J. Production and origin of oral malodor: A review of mechanisms and methods of analysis. J Periodontol 1977;48:13-20. 20. Goldberg S, Kozlovsky A, Gordon D, Gelernter I, Sintov A, Rosenberg M. Cadaverine as a putative component of oral malodor. J Dent Res 1994;73:1168-72. 21. Collins LM, Dawes C. The surface area of the adult human mouth and thickness of the salivary film covering the teeth and oral mucosa. J Dent Res 1987;66:1300-2. 22. DeBoever EH, Loesche WJ. Assessing the contribution of anaerobic microflora of the tongue to oral malodor. J Am Dent Assoc 1995;126:1384-93. 23. Bosy A, Kulkarni GV, Rosenberg, McCulloh CA. Relationship of oral malodor to periodontitis: Evidence of independence in discrete subpopulations. J Periodontol 1994;65:37-46. 24. Coil J, Tonzetich J. Characterization of volatile sulfur compounds production at individual crevicular sites in humans. J Clin Dent 1992;3:97-103. 25. Loesche WJ, Bretz WA, Lopatin D, Stoll J, Rau CF, Hillenburg KL, et al. Multicenter clinical evaluation of a chairside method of detecting certain periodontopathic bacteria in periodontal disease. J Periodontol 1990;61:189-96. 26. Loesche WJ, Kazor C. Microbiology and treatment of halitosis. Periodontol 2000 2002;28:256-79. 27. Addy M, Moran JM. Clinical indications for the use of chemical adjuncts to plaque control: Chlorhexidine formulations. Periodontol 2000 1997:15:52-4. 28. Bollen CM, Quirynen M. Microbiological response to mechanical treatment in combination with adjunctive therapy: A review of the literature. J Periodontol 1996;67:1143. 29. Jones CG. Chlorhexidine: Is it still the gold standard? Periodontol 2000 1997;15:55-62. 30. Rosenberg M, Gelernter I, Barki M, Bar-Ness R. Day-long reduction of malodor by two-phase oil: Water mouthrinse as compared to chlorhexidine and placebo rinses. J Periodontal 1992;63:39. 31. Rosenberg M, Kulkarni GV, Bosy A, McCulloch CA. Reproducibility and sensitivity of oral malodor measurements with a portable sulfide monitor. J Dent Res 1991;70:1436-40. Periasamy, S. and Yang, S.-S. and Chen, S.-Y. and Chang, C.-C. and Liu, M.-Y.